Ferry routes offer keen cyclists a great opportunity to explore new landscapes from the comfort of their own bike. Many ferry companies carry bicycles for free and foot passenger tickets can be picked up for a song according to a guide to cycling hotspots by ferry from Discover Ferries – the industry body for ferry companies. Travellers just need to pitch up to the port by rail or bus and walk onto the ferry with their bikes. The Hebridean Way Cycling Route is a 185 mile route, crossing 10 islands in the archipelago requiring the use of ferries. 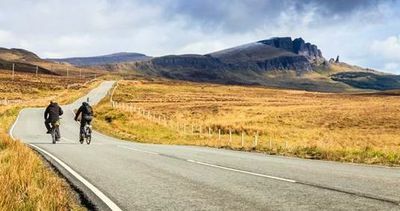 The Visit Scotland itinerary suggests taking six days to complete the route to really make the most of what the islands have to offer. Some highlights include the famous Luskentyre Sands, the ancient Calanais Standing Stones and the medieval Kisimul Castle, which is located in the middle of a lake. No trip to the Western Scottish Isles though, would be complete without a visit to a whisky distillery and the Isle of Harris distillery is one of the best. CalMac Ferries operate all routes between islands on the West Coast of Scotland – see calmac.co.uk/tickets. Bicycles are carried free of charge. The Irish are famous for their warm welcome and for taking life at an easier pace. Ireland’s cycle routes buck this trend, traversing mountain, lakeland, National Park and woodland. The Rathdrum Wicklow Gap cycle route, 1.5 hours’ drive from Dublin and 3 hours from Belfast, is 47 miles long and and with 1,130 metres of climbing involved it’s certainly not to be sniffed at. The route winds its way through the Glendalough valley famous for its stunning natural beauty, historic and archaeological richness and local wildlife.